Hello darlings! 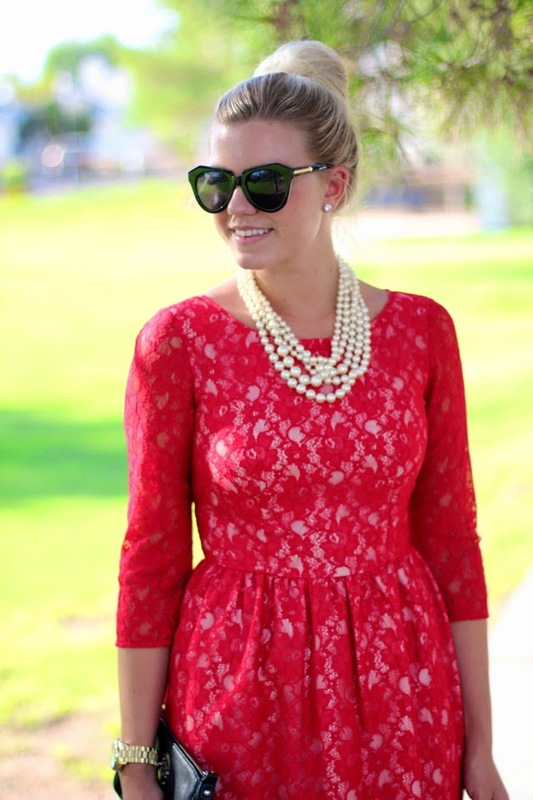 Today Jacqueline and I styled summer red as our trend, and I’m loving how fabulous this dress looks with a top knot. I wore this for our rehearsal dinner, and haven’t worn it since, so I decided to pull it out and style it a little differently! I chose a classic twisted pearl necklace and some chic leopard heels to dress up this fancy frock. How would you style this dress? Do you believe it could be dressed down? I think pairing it with an olive green vest and cognac boots in the Fall would dress it down a bit, right? Hope you are having a fabulous week! This week’s spotlight is Amy of Cupcakes & Couture. Her patterned outfit from last week is beyond amazing, so make sure to stop by her blog and say hello! 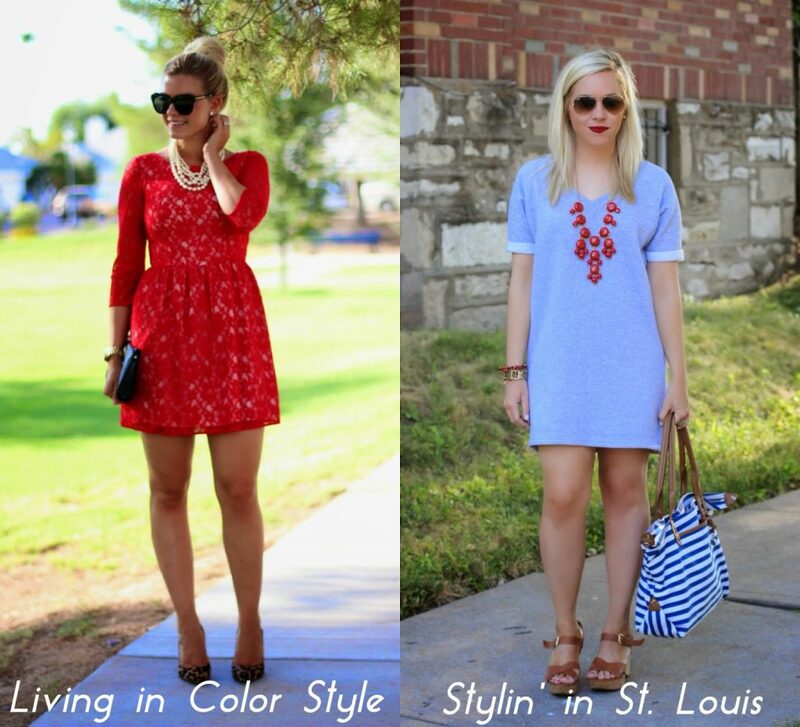 NEXT WEEK: Next week, instead of styling a trend as our spotlight, we want to celebrate your individual style! It’s a FREE WEEK, so you can link up any item, color or pattern you like! Thank you so much for reading, and for linking up! Absolutely superb outfit! This red dress is gorgeous! You look absolutely stunning!! Red is a great color on you!! Love red with leopard! Thank you for hosting! I am loving everything about this!! The red is the perfect red, the pearls are fab and you top not is perfect! Great Job! Stunning! You look gorgeous in red! Love how you styled this! um you look drop dead gorgeous!! 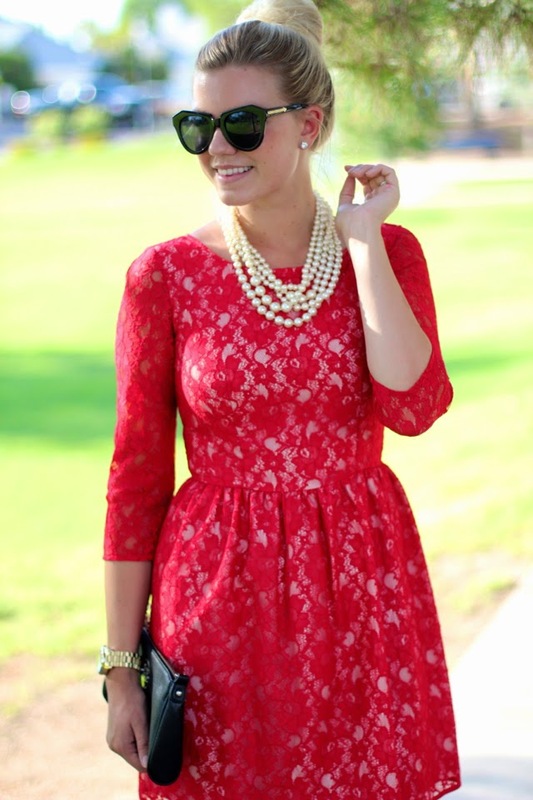 Love your hair like that and the lace and pearls are just perfect!! Your hair looks amazing like this!!! It lends such a classy vibe to your amazing lace dress. This dress is so pretty and paired will those leopard pumps is a knock out! Elle your dress is gorgeous and you look stunning in it. Love it. The dress can be dressed down just like you said. Oh my goodness!! that dress is amazing and the way you styled the look is perfection! LOVE!! I love this red dress Elle! Such a flattering fit on you and a beautiful color! Thank you for hosting this Linkup each week! IN LOVE with this outfit! you look so classic! You look absolutely stunning in that red dress! Love how your bun looks so chic and not too tight! How you described dressing this down was exactly what I had in mind when I read the question of how I would do it. Love love love this red dress on you! you look amazing in this red number and the leapord is such a nice touch. Amy is such a stylish gal and thanks for giving her the spotlight this week. AH! This dress is gorgeous, you look so beautiful Elle! love this red lace paired with the leopard!!!!! Girl – you are ridiculously amazing in this dress! (more than usual!) Loving it with the leopard heels. Just flawless. Thanks so much for hosting! Have a great weekend!